Also see more comments on Page 1 , 2, 3, 4, 5, 6, 7, 8 from diffirent years and tours by our clients even see the comments at , Few things speak louder and carry more meaning than first-hand experiences and personal testimony..
We want to thank you and the whole Earthbound-team for making our Mustang-trek a most memorable event. It has really been an adventure for lifetime! From the first e-mailcont act we had, you made a most convincing impression. 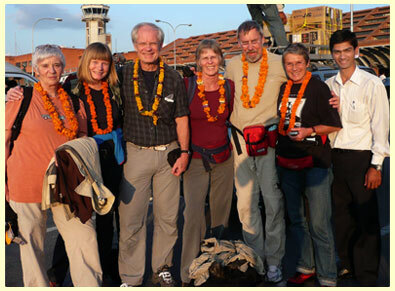 All our wishes concerning itinerary were promptly answered and we never had any doubt that the arrangement were in the best possible professional hands.The impression was only confirmed during our trek, from the day you met us with flower-garlands in the airport and till we left after three fantastic weeks with white khatas around the neck. Mustang, the steep dry hills, the giant white mountains, the friendly and proud people, the villages, monasteries and ancient Buddhist culture has made a deep and lasting impression. For some of our group of six, average age 63, some days could be a bit longer and steeper than we expected, but the encouraging and cheerful Earthbound-crew kept our spirit high. When we needed support they always had a helping hand. The Team of Earthbound Expeditions Dibash, Gokul, Gombu, Dawa, Nima, Kumar and Shankar all became our very good friends. Please forward to them our thanks and best wishes. I will send you some photos soon. We had a wonderful Annapurna trek with your guide Mr. Dibash. I think he is the best guide we could have had! He is a really nice man, with a lot of experience. And he took really good care of us. So we had a wonderful time in Nepal. Thank you for asking me about the trip. I just returned from a holiday in Nepal with my husband and two children aged 14 and 17 and I have to say it was the best holiday of my life! Please don't be put off by the current political situation of Nepal. As long as you are sensible and stay away from trouble spots you shouldn't encounter any problems. Tourists are so important to the economy that we are given priority when it comes to transport. During the strike, taxis carry special signs which say 'Tourists only' and these are allowed safe passage. Obviously I can only comment on the areas we spent time in. At the beginning of the trip we spent a few days in Kathmandu before flying to Lukla and fitting in a short trek to Namche Bazaar. There was absolutely no problem on the trek. People are so kind and generous and delighted to see you. We were staying in tea houses and met lots of people who were planning to trek to Everest Base Camp or even just as far as Tengboche Monastery. Unfortunately, we only had time to go as far as Namche but already the children are planning a return visit with the hope of making it all the way to Base Camp.We had organized the holiday through Rajan Simkada of Earthbound Expeditions in Kathmandu and we couldn't fault it. From the moment he met us at the airport, everything was really well organized, including our guide and porter for the trek. I wouldn't hesitate to recommend him. You can contact Rajan at: earthbound@wlink.com.np or visit his website at www.trektibet.com, I have to stress that at no time did we feel under threat or in any danger. The warmth and generosity of the Nepali people more than made up for it. Go and enjoy! Maz reminded me that you wanted a quote from us to put on your website - apologies for forgetting to send earlier. "Thanks to Earthbound Expeditions for the great time we had on our trek in the Annapurna. With the professional guide and porters taking care of us, all we needed to do was enjoy the breathtaking scenery. We wouldn't hesitate to recommend Earthbound Expeditions to our friends, and we hope to be back ourselves one day!" Finally, I have the new Sponsors page ready to upload but for some reason can't do it. I believe it's to do with restrictions the Chinese government . I'll upload as soon as I can - probably in about 2 or 3 more weeks (assuming it works properly in Laos!). Subject: A wonderful tour / trek in Nepal, thanks to Rajan! Dear readers, I am Andrea, the tour leader of an Italian / Swiss group of 8 people who had a great luck this year, enjoying a 15 days Mustang trek and Ti Ji ( Tenchi) from April 28-May 13th , 2005 with Earthbound Expeditions, and sharing this great experience with Mr. Rajan Simkhada, who was our leader on that trip. Plus, we spent some more days in Kathmandu, before and after the trek, visiting the most important places in the valley, always with his helpful presence. Well, since when I began organizing the trip, I had a very good impression of Rajan and the agency, as I asked so many questions to him, about itinerary, organization, schedules, everything. That is usually exhausting for many people, not for him who was very efficient in fast answers, always helpful and so precise that just before the beginning I had quite a good idea of how the journey could be. But it wasn't exactly as I thought because, despite of my high expectations, the journey went far over those expectations: this is not only my opinion, it's the opinion of everybody in the group: the perfect tour. Just in making the itinerary he showed me his experience, as I could realize later. In fact nobody in the group suffered for altitude sickness or for tiredness, and I am pretty sure (I have quite a good experience in high altitude trips) that it wasn't just "good luck", because the different stages were studied very well, to give to all of us the time for getting acclimatized, and improve our shape day by day. Rajan came with us as a guide, this was an impression plus, and he deserves a special thank for that, because he dedicated to us part of the precious time of his busy schedule; plus, with his presence and the one of the second guide , we had great traveling companions and we shared many special moments together. We could dedicate time enjoying the visit of the so many interesting gompas that Mustang offers, full of history and culture, and Rajan was so great in being a guide and translator; well, he has a good experience of the area, and this helped very much in having an incredible time, enjoying what better Mustang can offer, out of the beaten tracks too. The cook (Mr. Mingmar) and his staff were simply wonderful: in such difficult "conditions", with such that shortage of time to cook (considering the fact that they were on trekking too, with the tiredness that this involves): every day we had different hot meals, most of them freshly prepared: we had momos (made by hand just before the meal), spaghetti, pasta, wonderful pizza and cakes (both made without having an oven!! ), many typical dishes, vegetables, meat, rice, potatoes, French fries (in a simple word, everything, like we were in Kathmandu and not inside the mountains, far from the beaten roads). gaining weight. Plus we had hot beverages many times per day and hot water anytime we required it. All the equipment provided for the tour was perfect (tents, mattresses). The staff was always helpful and very eager to please, in any small matter regarding anybody of us, helping us for washing, preparing tents for the night, boiling water. So, I use this opportunity to thank Rajan again, for everything. We will have an unforgettable memory of the trip; the landscapes of Mustang are simply amazing, plus the culture, the people met during the tour, and the great, really great organization of Earthbound Expeditions as an impressive plus. I want to thank you so much for the great trekking, both in Tibet – Kailash, October 2004 and in Upper Mustang during the Tiji festival on May 2005. It has been a great experience trekking with you and your wonderful staff. The organization was perfect and I got treated like a queen, especially when it came to "food"! Thanks to the cooks I always had delicious meals and warm water whenever I needed. The tents were always ready at our arrival after our daily walks, so it gave us a very good feeling and a sense of security. I definitely will suggest anyone who wants to have a beautiful and unique experience on the Himalayan Mountains to contact "Earthbound Expeditions" trekking agency. Rajan is very kind and helpful to everybody and he would suggest the best to you. Thank you so much again for your kindness and the great work you has done for both trekking. Thank-you for your e-mail. I got back to London safely and looking for work at the moment. Thanks again for organizing our trip in Nepal - it really was a trip of a lifetime for me... memories that I'll never forget. 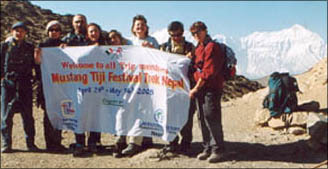 In April 2005, a couple of friends and I did the Mt.Everest package deal through Earthbound Expeditions. This experience was one I'll never forget. First and foremost, I got to achieve my dream of reaching Base Camp - thanks to our fantastic guide and porter, Ram. The trek was very well organised and the friendly staff really helped me out. They went out of their way to find me a pair of trekking boats (as mine had been stollen in India) and they leant me a sleeping bag and down-jacket free of charge. During the trek I felt that I was in very safe hands and was treated like a queen! The rafting and Jungle Safari was equally amazing. I would definately recommend Earthbound Expeditions to anyone wanting to trek in Nepal - their prices are very competitive and they provide the value-added benefits that other companies don't. Enjoy your travels. The Mustang trip was alternately health taking and terrifying. I could not have made it without the horse but some factors on the horse were extremely scaring as well as on foot. For me at age 62 the itinerary did not adequately describe the stamina and nerve refused for the trip, however, it therefore more than met my expectation of an adventure to remember. The Tiji festival was a real special. I have thought this trip for four years since meeting the prince of Mustang in Kathmandu. So it has been a dream fulfilled. I cannot say enough positive things about Rajan to describe his professionalism, values, honesty, respect, kindness and efficiency. I would feel comfortable in his care to go anywhere. I wish him and Earthbound Expeditions every success. This trip was a dream come truth. 8 months ago I read this book of Michel Peissel, which make me dream about an unknown area in the north of Nepal, belonging to the Tibetan culture. The landscapes went beyond all expectation it looked shaped by human's hands. It's diversity in shapes and colors transported me another planet. Regarding the culture, It was very refreshing, different from all what I have seen in Nepal. The Tiji festival showed me there was still a place where the Tibetan Buddhism remains unmolested and practiced with fervor. And all this lops as wearing traditional dresses were very authentic. It’s a pity that it seems the new generation is more attracted by Nike pullovers, Reebok Caps, Chinese shoes. Concerning the organization, I found it very well, even if I was feeling little bit confuse to have so many people working for me. I'm usually used to a budget way of traveling, of doing everything by myself and these everything was prepared, cooked for me. Embarrassing and agreeable in the same time.